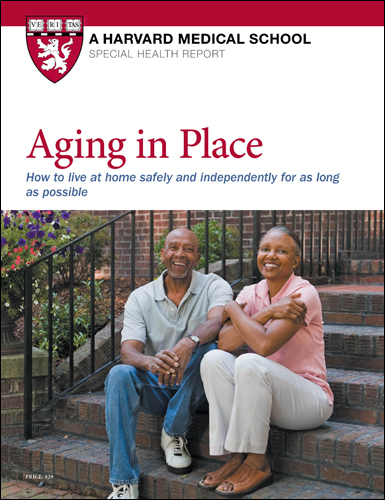 Aging in Place is the comprehensive planning guide for living safely and independently for as long as possible—wherever you choose to live. You’ll get guidance for modifying a home to meet your changing needs. You’ll read how to ensure comfort and increase convenience and security—without straining your budget. Plus, you’ll find valuable tips for keeping yourself healthy, for deciphering the options of Medicare, for smart financial and legal planning, for utilizing online services, for getting help at home, and so much more. Can I have the retirement I’ve dreamed of? This Special Health Report answers the question. And the good news is: Yes! You can make it happen! This empowering guide will dissolve any doubts and show you how you can effectively safeguard your future and protect your plans and dreams. All the right moves — even if you stay just where you are. According to AARP, 90% of people over 65 want to remain at home — whatever that means to them — for as long as possible. Regardless of what physical location you decide to call home, you want to live there safely, comfortably, and independently. Aging in Place is written to help you do that with confidence. Want to give your house more “staying” power? This guide will show you how. Whether it’s a new smaller house or your longtime residence, Aging in Place offers uncomplicated ways to keep your home in step with your changing needs. You’ll be ready for the decisions that make a difference. • Make the most of services (including free!) for seniors in your state or town. With Aging in Place you will understand what is too often overlooked. Most importantly, you will gain reassuring certainty that you are making the best choices for yourself or for a loved one. You’ll discover dozens of tools, tips, and tricks to keep you safe and secure. From a 32-point home safety checklist to a warning of 18 medicines that can increase your risk of a fall, when it comes to keeping you safe, Aging in Place covers all the bases. You’ll read why after 65, you’re more likely to suffer a foodborne illness (and eight specific tips to avoid problems). You’ll find ways to increase your home security… how to choose the best home monitoring and best medical alert devices. If you’re considering an in-home caregiver or assistant, our experts share how to evaluate your needs, how to screen caregivers, and how to best finance home care. Although aging in place might be your goal, it ultimately isn’t right for everyone. Even if you’re currently healthy enough to stay in your own home, you need to prepare for any future eventuality. This report will also help you decide when it’s time to move to a place where you can get the care you need to stay safe and healthy — and can possibly even make new friends. Prepared by Harvard Health Publishing in consultation with Suzanne Salamon, MD, Associate Chief, Gerontology Division, Beth Israel Deaconess Medical Center. (2018). 49 pages. Why do older adults fall? The feasibility of aging in place begins with your physical health. If your health and mobility are good—and you can adapt your home to accommodate anyhealth and mobility issues that might develop in the future—you can feel comfortable staying whereyou are. The questionnaire “Am I a good candidate for aging in place?” on page 3 will give you a starting point for considering this broad topic. Clearly, if your health and mobility are good, you’ll have far fewer obstacles to remaining in place than if you need frequent medical attention and assistance in the home. Basic steps—including eating a healthy diet and being physically active—can go a long way toward enabling you to maintain your health. The chapter “Stay healthy to stay independent,” starting on page 11, goes into greater detail on these steps. Fostering social connections with friends and neighbors also helps. Not only do social contacts give you an incentive to live more healthfully, but they also provide support in case you need assistance or someone to check in on you regularly. The chapter “Build social connections,” starting on page 17, can help you expand your circle of friends. driving (see “Driving and your independence,” page 40), and help you with financial and legal planning (see “Planning for your future,” page 5). However, even with all these measures, you may find that it is not possible to achieve the three goals of safe, independent, and comfortable living. Conditions like arthritis, dementia, or a stroke can throw off your balance and judgment to the point that selfcare tasks like cooking or getting dressed become difficult, and even a simple trip to the bathroom is fraught with danger. If your partner passes away and you don’t have family nearby, home can be a very lonely, isolating place. If your home becomes hard for you to navigate safely, or you lack the resources to make the needed adjustments, it could be time to consider other options (see “When it’s time to move,” page 43). As you contemplate the changes that would enable you to age in place, it’s also wise to consider the factors that might make it necessary for you to move at some point. That way, you can anticipate problems and prepare for them. Think about what type of community you’d want to live in based on your health, stage of life, and finances. Making these types of decisions ahead of time will prevent you from having to scramble at the last minute—and possibly from ending up somewhere that doesn’t suit you. You may even find that you’re happier living in a place that offers social interaction and round-the clock support than you would be at home alone.